Commentary: Why do we hate the NRA? Why do we hate the NRA? 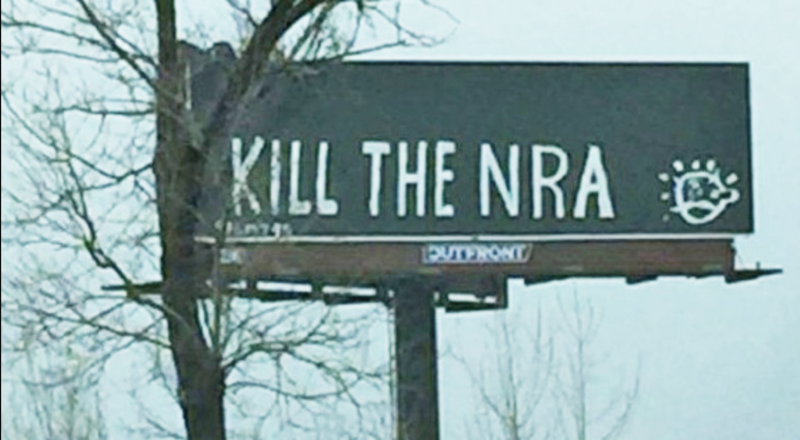 Yesterday the hashtag #KillTheNRA started trending on Twitter, inspired by a vandalized billboard in Kentucky bearing the same message. It echoed comments from student survivors of the Parkland High school shooting on CNN over the weekend. When asked for their message to the National Rifle Association their response was "Disband. Dismantle. Don't you come back here." "The fact that [the NRA] was in power for so long just goes to show how much time we need to spend fixing our country," Parkland student Emily Gonzalez said. When the CNN anchor pointed out the NRA "gives millions of dollars to politicians, Gonzalez replied, "Politicians who accept this blood money are against the children, they're against the people who are dying." Fellow student David Hogg added "If you can't get elected without taking money from child murderers, why are you even running?" To recap: the NRA is a group of "child murderers" who hand out "blood money" to desperate politicians to buy their support for the Second Amendment and, therefore, it should be "killed." Have I got that right? I'm double-checking because, as a regular, gun-owning-but-it's-no big-deal, supports-the-Second-Amendment-but-isn't-an-NRA-member guy--that sounds nuts. Let's start with a basic fact about the NRA that seems to have been lost: The "A" is for "Association." As in "freedom of association?" Or "assembly" as it's called in the First Amendment. Some 5 million Americans choose to pay dues and "associate" with other like-minded people who share their views on gun ownership. This distinction doesn't make the NRA good or bad, but it's simply wrong to look at them the way we look at, say, the National Beer Wholesalers Association when it comes to the issue of DUI laws. The NRA isn't the beer sellers. It's the beer drinkers. Which is why it hurts informed ears so badly when pundits talk about the NRA's power coming from its money—as though gun companies like Smith and Wesson have been defying the will of our democracy with their blood-soaked, ill-gotten gains. Please. America spent about $15 billion on guns last year, or one-one-thousandth of our national GDP. To put that number into perspective, Fortune.com reports that Americans spend far more than that--$23 billion—on pet food each year. Ah, but the NRA gives more money to politicians than the American Pet Products Association (yes, there really is one, along with the Pet Industry Distributors Association). Of course they do. Because there's no "Right to keep and feed pets" in the Constitution. You won't find #KillThePetProducts trending on Twitter, either. Admittedly, more significant was the money the two groups spent promoting their cause and attacking their opponents, $15 million by Planned Parenthood and $54 million by the NRA. Both of those figures, however, pale in comparison to the $90 million California billionaire Tom Steyer spent on the 2016 presidential race by himself--his part of more than $2 billion in total spending on the Hillary vs. Trump battle. The NRA's contribution to Trump's election, $30 million—is about 1.5 percent of that total. And once again—remember where most of that money comes from. Not from the profits of Dr. Evil's "Virtuecon," but from members and donations. Citizens who pay dues and write checks for a cause they believe in. If gun-control activists truly believe that the NRA is just buying off our democracy with its donations, there's an easy solution: Buy them yourselves. Take Tom Steyer's $100 million and offer it to enough members of Congress to pass a gun ban. Tell them you'll double their last contribution from the NRA. Viola—problem solved! Ah, but it isn't, is it? Because the "bribery" argument was always bogus, and the #KillTheNRA crowd knows it. The NRA didn't create America's support for the right to gun ownership and self-defense. It reflects it. Arguing that the NRA "is running our government" is essentially arguing that the voters are running the country. Americans consistently say they oppose a ban on gun ownership, and by a wide (70-28 percent) margin. Even in the wake of the Parkland High shooting, only about half of Americans support a return of the so-called "assault weapons" ban. This is hardly shocking given that about 40 percent of Americans—not American gunmakers or NRA stooges, but American citizens—live in gun-owning households. What the NRA's opponents hate isn't the organization. It's the millions of American voters who support it.